An excellent reputation for its ability to help aid in sleep. It is also known to reduce stress and is suggested to be an effective therapy for anxiety. 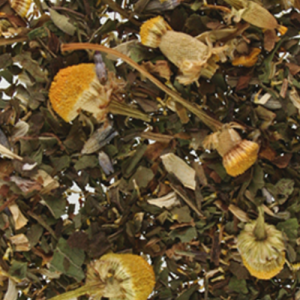 The subtle apple flavor of Chamomile is perfect for adding into an herbal tea infusion. Apple bits, hibiscus blossoms, and orange peels come together to make this delicious blend. A blend of hibiscus, rose hips, chicory root and chamomile flowers features the island flavors of mango and strawberry. 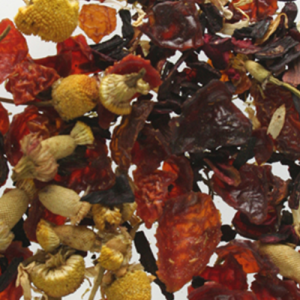 Hibiscus and rose hips that are blended to create the vibrant magenta base for our on-of-a-kind Prickly Pear Herbal tea. 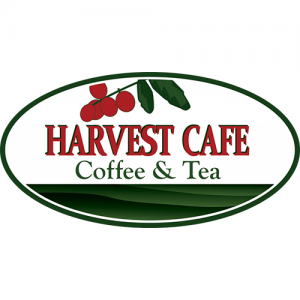 A colorful blend of hibiscus, rose hips, chicory root and chamomile flowers is infused with raspberry flavor, resulting in a vibrant red tea with tart, memorable flavors. A soothing blend of chamomile, peppermint, and lavender, this infusion is a calming tea, perfect for tranquility and healing. Colds, flu, headaches and stress can be relieved with the herbs that make up our relaxing blend. Blended with herbs naturally grown around the world, this soothing herbal tea is a subtle blend of peppermint, ginseng, cinnamon, and other natural herbs and flavorings. A delight to the taste buds and a gentle natural aid for digestion. An explosion of flavor amongst a rich backdrop of Rooibos. With added notes of cardamom, red peppercorn, lemongrass, cornflowers, cinnamon chips, orange peel, cranberries, apples, papaya and grapefruit flavor, this elaborate tisane is as unforgettable on the palate as it is beautiful to behold. 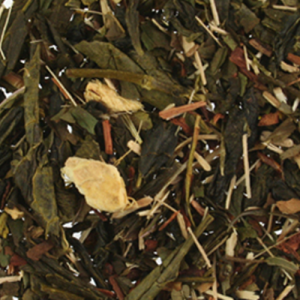 A perfect harmony of sweet and spicy to robust and zingy, this alluring tea is nothing short of exceptional.